Storm Nate has weakened to a tropical depression after bringing strong winds, heavy rain and some flooding to the south-eastern United States. It made landfall as a hurricane twice, in Louisiana and Mississippi, and is currently over Alabama. Storm surge warnings have been lifted across the region. Although it was not as strong as last month's Maria and Irma, the states of Louisiana, Mississippi, Alabama and parts of Florida had issued warnings and evacuation orders ahead of its arrival. Film footage from Biloxi, Mississippi, where the storm made landfall, showed flooded streets and highways. But the waters quickly receded, leaving boats and vehicles marooned. 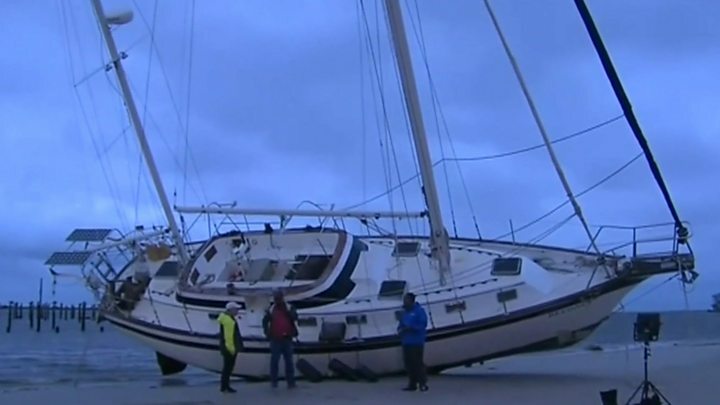 Mayor of nearby Gulfport, Billy Hewes, told the BBC the storm surge did not appear to be as high as feared and he thought the damage there would "be minimal". 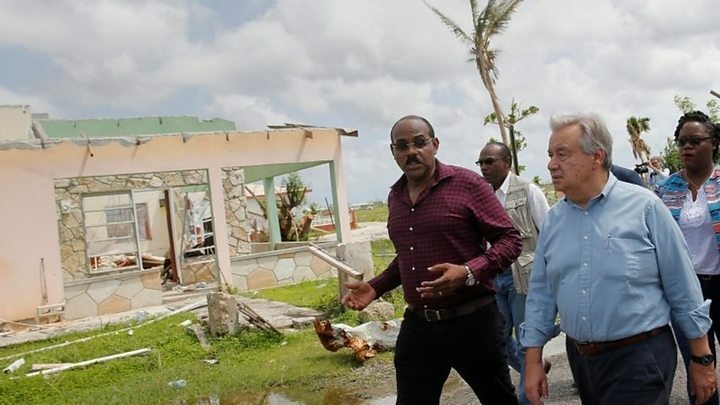 Media captionUN Secretary General Antonio Guterres: "The origin is clear - we are facing the consequences of climate change"
In southern Alabama, the local power company said some 5,000 people were without power. Residents there had been urged to take precautions ahead of Nate's arrival. A mandatory curfew was lifted in New Orleans, Louisiana, as the threat to the city - devastated by Hurricane Katrina in 2005 - was downgraded. Nate was downgraded from a hurricane to a tropical storm by the National Hurricane Center at 09:00 GMT on Sunday, and later to a tropical depression. Warnings of storm surge flooding were lifted on Sunday afternoon. Five ports along the Gulf Coast were also closed to shipping as a precaution ahead of Nate's arrival. Most oil and gas platforms in the US Gulf of Mexico also evacuated their staff, but are now planning to reopen. "There is an increasing intensity of hurricanes, an increasing frequency, and increasing devastation," he told the BBC. "The origin is clear - we are facing the consequences of climate change."